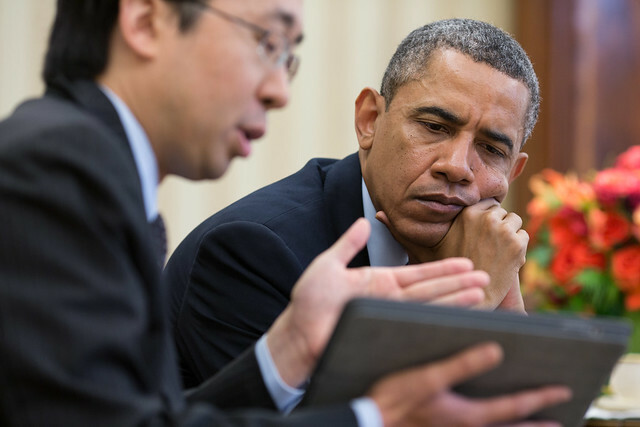 ← Roundup: who said what about the White House executive order on open data? On Wednesday, President Obama issued an historic executive order making open data the new default for releasing information in the federal government. And one of the things we’re doing to fuel more inventiveness like this, to fuel more private sector innovation and discovery, is to make the vast amounts of America’s data open and easy to access for the first time in history. So talented entrepreneurs are doing some pretty amazing things with data that’s already being collected by government. So over at the Capital Factory, I met with folks behind the start-up called StormPulse, which uses government data on weather to help businesses anticipate disruptions in service. And then you’ve got a Virginia company called OPower that’s used government data on trends in energy use to save its customers $200 million on their energy bills. There’s an app called iTriage, founded by a pair of ER doctors that uses data from the Department of Health and Human Services to help users understand medical symptoms and find local doctors and health care providers. And today I’m announcing that we’re making even more government data available, and we’re making it easier for people to find and to use. And that’s going to help launch more start-ups. It’s going to help launch more businesses. Some of them undoubtedly will be using this data powered by chips that essentially started right here at Applied Materials. It’s going to help more entrepreneurs come up with products and services that we haven’t even imagined yet. This kind of innovation and ingenuity has the potential to transform the way we do almost everything. One-third of jobs in Austin are now supported by the tech sector. And we should do all we can to encourage this kind of innovation economy all across America, in ways that produce new jobs and new opportunities for the middle class.